MUMBAI – A last-ditch attempt to save a “man-eating” tigress is underway in India, following a decision by the country’s Supreme Court to grant forest rangers permission to kill the endangered animal in the western state of Maharashtra. 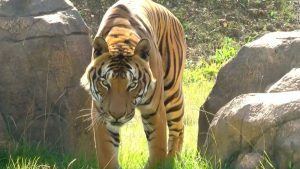 The tigress, known as T1, is believed to be responsible for the deaths of 13 people since January 2016 in the state’s eastern Yavatmal district. Three were killed in August alone. In one particularly grisly case, as much as 60% of the victim’s body had been consumed by the tigress, according to official records. India’s tiger population is strictly protected and any attempt to kill one of the animals requires approval from authorities under the country’s Wildlife Protection Act. In Tuesday’s ruling, the court sided with local authorities in allowing forest rangers to shoot the tiger if they fail to capture it, striking a blow to activists and campaigners battling to save the tigress. “They (the forest officials) only plan to kill, which we suggested to the court, because they have issued an order to hire a hunter,” said Subramaniam, who is the founder of Mumbai-based nongovernmental organization Earth Brigade. “The depletion of forest land through cattle grazing is the biggest problem. Tigers aren’t encroaching on human habitats. It’s human beings who are continuously coming in,” wildlife conservationist Ajay Dubey told CNN. Despite evidence — including photographs — presented by forest officials in Yavatmal linking the tigress to attacks on humans, campaigners say there are inconsistencies in the investigation. “Any animal can be declared a ‘man eater.’ This labeling is a colonial hangover,” said Subramaniam. “We want a transparent operation. We are going to approach the governor of Maharashtra to protect this tiger. It is wrong especially as she is the mother of two cubs. How can you have the right to eliminate a defenseless mother?” said Dubey. “Any court that issues a shoot-to-kill order does not ever write ‘shoot to kill,’ they always say ‘try and capture, failing which, you shoot.’ There needs to be a policy where one order is exclusively for capturing and if those attempts have failed, then a separate order is issued for shooting the tiger,” she said. In spite of the threats that India’s tiger population faces, numbers are gradually rising. But more work still needs to be done. “For us, this isn’t about one tiger. It’s about the species,” said Subramaniam.